A former librarian by trade, Avi once wrote that childhood has less to do with biological age, and is more about economics. He’s right. Social class and economic circumstance shape our experience of childhood in vastly different ways, even though all children do share the same needs for security, approval, and justice. One of Avi’s useful abilities as a writer is that he can take his youthful readers out of their comfort zone, and drop them down into historical settings where everyone – characters and readers alike – have trouble finding their bearings at first, physically and morally. But.. but [they] would be all men. Mr Gummage. And…I am a girl. It would be wrong!” I cried, in absolute confidence that I was echoing the beliefs of my beloved parents. Mr Gummage drew himself up. “Miss Doyle,’ he said loftily, ‘ in my world, judgements as to right and wrong are left to my Creator, not to children. Now, be so good as to board the Seahawk. At once! Once on board, Charlotte gravitates quite naturally to the manners and graces of the ship’s master, a Captain Jaggery. Suffice to say that during the journey across the Atlantic her perceptions of the captain and crew and of her own place in the world all undergo some very drastic revisions. As Captain Jaggery’s true nature becomes apparent, we are soon sailing the turbulent waters of mutiny on the high seas, with Charlotte forced to choose sides and take the consequences – which she does, with great resilience. In a surprising coda, Charlotte also comes to recognise that the rigid and intolerant captain of the Seahawk and her own beloved Papa have far more in common than she realised. What we have here is a rattling good yarn, brilliantly told. One that casually spoofs and subverts the conventions of gender and social class. Like Huckleberry Finn, Charlotte is on a one-way journey out into the world – he on a raft, she on the Seahawk. Like Mark Twain’s hero, the young white adventurer in this book gets indispensable help from a black man who befriends her. In Huck’s case, from Jim the runaway slave. For Charlotte, her guardian angel proves to be the old ship’s cook, Zachariah. Pointedly, he and Charlotte have a conversation that establishes that while he ran away to sea, Zachariah was never a slave. Charlie says everybody has to raise their parents. Is that true? He says the time comes for all of us when we have to kiss them goodbye and trust them to be okay on their own. Partly through circumstance, partly through her own sense of self preservation, Charlotte Doyle reaches much the same conclusion. Down the years, Edward Irving Wortis (aka Avi) has been a prolific writer in just about every genre imaginable – historical fiction, animal stories, fantasy, serials and experimental fiction. Now 73, Avi was raised in New York amid a family of writers and social activists. As a child, he suffered from dysgraphia, a writing dysfunction characterised by chronic bad spelling, word omissions and confusions between right and left hand columns on the page. Despite these handicaps, he persevered as a writer. Towards the end of Charlotte Doyle, one of the worst sins levelled at her by her enraged father is…the bad spelling in her journal. If things had gone to plan, The True Confessions of Charlotte Doyle would be being released in 2011 as a big budget film directed by Danny DeVito, with Pierce Brosnan as Jaggery, and Morgan Freeman as Zachariah. In a casting coup, the Irish actor Saoirse Ronan (of The Lovely Bones and Atonement fame) was set to play Charlotte. Yet four weeks into pre-production in late 2008, Freeman had a serious late night car accident, and with a woman not his wife in the passenger seat. The film was derailed as a result. Last year, Devito was reportedly sued for a $500,000 finders fee by the person who had helped him to secure $10 million of the film’s budget. Devito still owns the rights, but the film seems permanently on hold. True, there were people who liked Devito’s film version of the Raoul Dahl story Matilda, but I can’t help seeing the cancellation as a blessing in disguise for people who really love this book. Saoirse Ronan would have been a great Charlotte, but she alone might not have been able to save the film from DeVito’s usual eccentricities. And so you and I, Miss Doyle, shall understand one another, shall we not? Oh yes sir, I’m sure, sir. You do my heart good,’ he cried. ‘And you have permission to come to me if you are troubled in any way, Miss Doyle. If something frightens you or…if perhaps you become…how shall I say…apprehensive. If you hear rumors…This crew, like all crews, grumbles and complains, You go to school?’ he asked suddenly. ‘And though you love it and love your mistresses, I’m sure even you and your companions have critical things to say ? 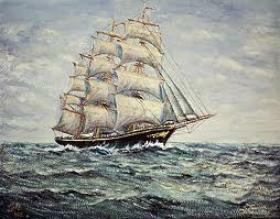 I had begun to edge towards the steps to the forecastle deck, thinking the men there would stand behind me. But as I approached, none moved forward. I stopped. You mustn’t believe him !’ I cried. Don’t be afraid of her,” Captain Jaggery cried. ‘ Look at her. She’s nothing but an unnatural girl, a girl trying to act like a man. Trying to be a man. She can only harm you by living. Let her have her punishment.”…I backed away from him until I was atop the forecastle deck…The captain in careful pursuit, now slowly mounted the steps to the forecastle. I retreated into the bow, past the capstan, on a line with the bowsprit. He kept coming. Against the moon, he seemed to be a faceless shadow, a shadow broken only by the dagger-like glitter of the pistol that caught the light of the moon…I looked for a way to escape, but found none. due to constant re-writing.) 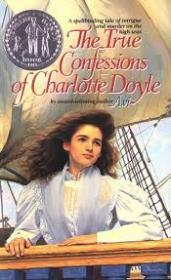 While Charlotte Doyle remains one of Avi’s most enduringly popular titles, it reached only the shortlist for the Newbery Medal in 1990. In 2002, he won the Newbery award outright for his book Crispin : The Cross of Lead. In passing, Crispin can also be recommended. This time, Avi’s setting is 14th century England, and the perilous struggle of a peasant boy to discover his true identity. The book sets Crispin’s problematic task within the social rules of the time, amidst a context of feudal slavery that is barely imaginable to modern readers, young or old. With deceptive ease – and in the midst of another crackling good yarn – Avi achieves what any number of worthy textbooks try to do and fail. Namely, he gives young readers entry to the customs and worldview of a bygone age. Ultimately, Crispin’s struggle for security and justice proves to be the same as that faced by any modern readers of his story.